This is my daughter Stephanie a few years ago. I think she is was about 11 years old. She was modeling for an agency in Smithtown, and we were traveling into Manhattan a lot that summer. This is a picture my niece, Kim took of her when we were visiting her in North Carolina; a much better picture with a natural smile. 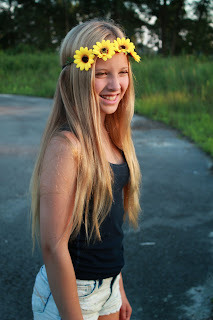 It's easy to love a beautiful young girl who is sweet and kind, but when she turned 12, it seemed as if "that" girl disappeared. Don't get me wrong, " that"girl is in there somewhere. I see glimpses of her occasionally. I love her and tell her so all the time and I really mean it, but sometimes I wish for the girl who freely wrapped her arms around me without pretense. I pray that "that" girl will emerge on the other side of puberty unscathed, or even better! God knows exactly what He is doing in her life, and how He will shape her for His honor and glory.We prayed for her before she was born. I especially prayed for her while she was in utero, because she was the child that I wasn't sure that I would have. I was 42, and there are 7 years between Stephie and my son Matt. I waited a long time for my second girl, and was wonderfully amazed that God answered my prayer for 2 girls and 2 boys. I love her more now than when she was just a dream. I love her through all the crazies that girls have in their teens, and believe me, crazy is a calm word for a girl!